I’ve been a sporadic journaler all my life. About once every three months, when inspiration struck, I’d seize my journal and dash out several pages. But most of the time, it sat on my shelf, collecting dust. About six months ago, I decided it was time to start a daily journaling habit. We’ve all heard that writing more frequently makes it easier to write more, and between my motorcycle blog, Copyblogger, and other personal projects, I wanted to see if I could activate that superpower in myself. But that wasn’t the only hypothesis I wanted to test. I had been feeling overwhelmed, like time was flowing too quickly and it was all I could do to keep up. At the time, I was reading Alex Soojung-Kim Pang’s The Distraction Addiction, and the book points out that “real time” technologies like email and text messaging have created a distorted view of how quickly we’re supposed to operate in the world. Until recently, the flow of information and communication had strict physical limits. Mail and newspapers arrived once daily; phones only made one call at a time. Now, we get push notifications, emails, texts, IMs, and phone calls every hour, sometimes simultaneously. When I first started writing, the time and place were sporadic. I wrote when I remembered to — morning, noon, or night. But slowly, I began to feel a pull toward writing first thing in the morning. By December 2017, a routine crystallized: wake up, make coffee, and sit down to write. I sat in the same spot every day: the chaise part of our sectional, facing an east window. As the sun rose, I wrote and sipped my coffee. On cold mornings, I nestled into my fuzzy, dark blue blanket and propped the journal on a pillow in my lap. I wrote with my favorite pens (0.5 mm Pilot G-2s) in my favorite unlined journals (bought at the bookstore down the road). The phrase became an invocation, calling my muses to attention and reminding me that showing up was the important part. So … how did it go? Like a true data nerd, I went through my journals and documented how many pages I wrote each day. And the data shows that I did, indeed, show up: of the 169 days between November 13, 2017 and the end of April 2018, I only missed 22, or about 10 percent. I was best at writing in the middle of the week — I didn’t miss any Thursdays, and only one Tuesday and one Wednesday. Saturdays were my worst day for writing — I skipped 15 Saturdays, almost 40 percent — which makes sense because my schedule was less structured on weekends. As the weeks passed, I began to notice that it was easier and easier to write a full page. In fact, it started to become rare that I would only write one page. That feeling was reflected in the data: in November, 60 percent of my entries were a page and a half or longer. By January, that number was nearly 80 percent. My plan seemed to be working; by creating a habit of daily journaling, I was naturally becoming a more prolific writer. By mid-March, things were going pretty well. Almost half of the posts I wrote that month were longer than three pages, and I barely noticed the effort. I grew to rely on my cup of coffee and half an hour of quiet time in the mornings. At the end of March I was summoned to jury duty, and then selected for grand jury service, 8:30 a.m. to 5:00 p.m., Monday through Friday, for a month. I lost several days on the new schedule, and then when I did write, it was a completely different routine. Instead of heading straight for the couch with my coffee first thing, I got ready to leave before sitting down at the dining table to write. I’d still try to write a page, but I let myself write as much or as little as I could — the main thing was showing up. Some days I could only muster half a page. In retrospect, I think shifting my routine to write at the dining table helped me keep my writing habit intact. But whenever I had the time to sit down in my usual spot on the couch, I ended up writing just as much as I did in March. Building this daily journaling habit has been an interesting case study in the power of habit and environment. During my grand jury tenure, I read Adam Alter’s Drunk Tank Pink. It’s an interesting book that chronicles several studies on how very small changes in our environment affect our behavior. For example, lighting can affect how truthful we are, looking at nature appears to help our bodies heal, and the presence of the color red can trigger anxiety responses that lead us to perform worse on tests. One of the studies I found most interesting was a memory recall study involving divers. The researchers selected two groups of student divers. One memorized a list of words underwater and another memorized those words on land. Then, they tested the students’ recall. Some were asked to remember the words in the same place they memorized them (i.e., recalled the words underwater when they memorized the words underwater), others did the opposite (i.e., recalled the words underwater when they had memorized the words on land). Does environment have an effect on memory? As it turns out, it did. Divers were more accurate when remembering the words in the same environment they had learned them. “These studies tell us something profound and perhaps a bit disturbing about what makes us who we are. How we think, feel, and behave in the world is subject to a range of influences much broader than our rational thoughts. We might not consciously recognize how our environment influences us, but that doesn’t mean it has no effect. Developing this habit doesn’t mean writing will always be easy — I do still have slow, writer’s-block days. But I have fewer of them. 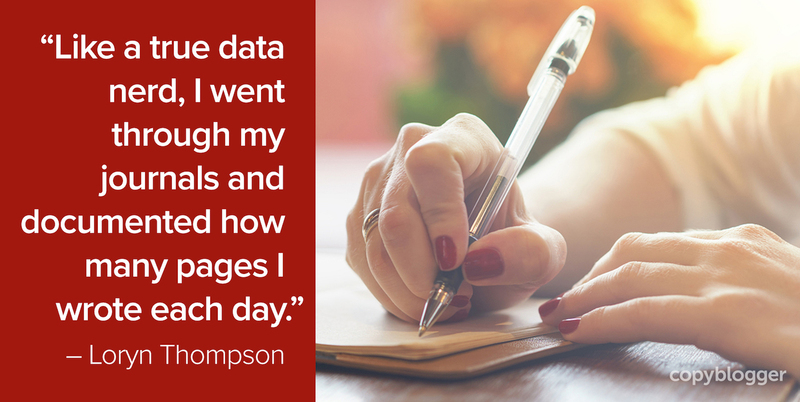 Did writing every day give me superpowers? But it did have a quantifiable impact on my journaling output, and many intangible benefits for my happiness and wellbeing. Next article: Is There Still a Difference Between Marketing and Selling? I’ve been trying to make a habit of either doing morning pages or journaling but it seems like it’s the first thing that gets pushed aside. This makes me want to seriously try to get the habit started and see where it takes me. I totally understand that. Getting “pushed aside” is one of the reasons this became a morning habit — after I got up and made my coffee, I made a beeline for the couch, no matter what was going on that day. When I knew I was going to be really busy, I would wake up earlier to make sure I had time to write. I write my rear end off daily Loryn, for business of course but mainly because I have so much fun writing. Writing a journal, blogging or even writing blog comments helps words flow. You practice and writer’s block becomes a thing of the past. Beautiful how it works. That’s exactly it 🙂 Thanks for reading, Deborah! I almost write every day except for the few days off that I take after three or four months. I’d say that I’m not good at developing routines and building habits, but instead, I’m more of a to-do list person. When I schedule writing first thing in the morning, I can’t do anything else then. But I couldn’t agree more that writing every day can do wonders for us. I read this at a time when I am struggling with a writers block after 8 years of writing. But more than anything, I loved your style of writing. This is probably the first article in a long time I have read from start till end without “scanning through”. I wish I could actually convey how attractive your style of writing is here. Engages the reader on a personal level. And just so you truly understand how much I appreciated this article – in the last 8 years of reading blogs daily and writing for a living, this is probably just the 2nd or 3rd time I have commented on a post. Vijay — Thank you so very much for the heartfelt compliment. I’m glad my writing resonated with you, and I hope it helps move you past your period of writer’s block! Don’t worry, it might not seem like it now, but you will get past it. Thought this was a really insightful piece. In my experience, habits are hard to get into, I’ve heard that it takes three weeks of being consistent to truly establish a habit, but can be really beneficial in the long term. For me, writing first thing in the morning and last thing in the evening seems to be the best for more creative work. Writing on a regular basis definitely makes the whole process easier though!